Glass Beach: Happy May Day! I’ve always loved May Day. First, it reminds me of my childhood, when my mother, sister and I would make little baskets of flowers to leave on the front steps of our favorite neighbors. I also love May Day because some say that in ancient Greece, they celebrated the goddess Maia (hey, that’s me!) on May 1. My parents thought they made up my name when they gave it to me, but I’m fine with being named after a Pleiades. 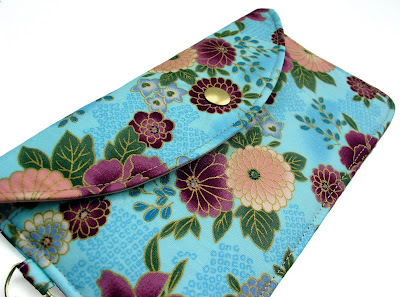 I didn’t have time to make up any little bouquets with my daughters this year so all I can offer in celebration is a new wristlet wallet that has lots of pretty flowers. Any suggestions for a name for it? I've always loved May Day too, we used to put little boquets of flowers (often dandilions) on neighbors' doorsteps. How about "Bloom"? I love the wristlet. Ooh, Yazmin, that's a lovely name for the wristlet! Can I hire you as a naming consultant? Sandra Eileen, it's great to hear that other people left little basket!